A wilderness experience awaits along Harper Creek. This is not your typical, easy hike to Harper Creek Falls. However, this is a relatively gentle encounter with wilderness due to its short length, moderate grade, and sparse (but useful) trail blazes. 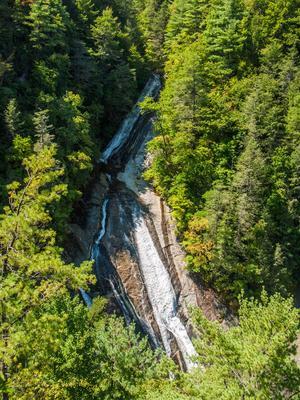 From intimate creekside scenes, to long-distance views, to close-up encounters with two major waterfalls, excellent scenery awaits along this hike. You'll follow a major, free-flowing stream for several miles and cross it a total of 12 times, getting you wet up to your knees. Not recommended in winter or during high water. From Asheville, N.C, take I-240 East to I-40 East through Black Mountain and down the mountain to Morganton. Take Exit 100 (Jamestown Rd.). Turn left at the end of the ramp. At the third traffic light, turn left onto NC Hwy. 181 north. Follow 181 for about 12 miles to Brown Mtn. Beach Rd., at a church, and turn right. Go about 5 miles; just past a bridge over Wilson Creek (which looks like a small river) turn left to stay on Brown Mtn. Beach Rd. (There is a sign for the Pisgah National Forest Mortimer Campground.) You will follow Wilson Creek through the settlement of Brown Mountain Beach, then into its beautiful Gorge section, and the visitor center is on the left approximately 5.5 miles past the left turn. Go 1.6 miles past the visitor center to the small parking area on the left, which will probably be full on popular weekends. Begin the hike on the signed Harper Creek trail (#260) at the back of the parking lot, which immediately goes up a steep climb up to the gap to intersect with Yellow Buck trail (#265). The climb - on a section of trail constructed in 2006 - is not particularly well routed; it is eroding terribly in spots. It merges with an old road bed that was already terribly eroded before it became part of the trail. It merges again with the old official trail right before reaching the gap. The old trail was well graded and not very eroded, but didn't have much parking at the beginning. Anyway, bear left on Harper Creek trail, and start a gentle descent on an old logging road. The orange-blazed trail is mostly wide and smooth. It's easy to follow, with a few sandy, muddy, or wet spots and a couple of small branch crossings. You will come to a point that is about 30 feet above the creek with a nearly vertical slope down to it; the trail has eroded in places leaving only bare rock and a narrow tread, making for a sketchy traverse. Then the trail moves into an area with lots of campsites. 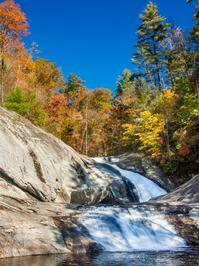 Harper Creek Falls, one of your destinations on this hike. At the campsites and a large flat area, several side paths lead left; stay straight on the blazed trail. At a particularly good and large campsite, you reach the first intersection on the hike. It is signed. Both signs list the trails as "440", which corresponds to the Mountains to Sea Trail only. The Mountains to Sea Trail comes in from the left on what is also the Raider Camp trail (#277) and goes uphill, right, on the Harper Creek trail (#260). You could go either way, but I like to get the relatively straight and steep Raider Camp trail out of the way and leave the excitement of descending Harper Creek for the last half of the hike. It's your call, but if that sounds good, bear left onto the yellow-blazed Raider Camp trail (#277) and immediately come to the first crossing of Harper Creek. This begins the loop portion of the hike. Here, you'll need to make a judgement call. This is the furthest downstream crossing you'll make on this hike (with the most water), but it's also one of the easiest. The creek is wide and threaded at this point, with many smaller channels, gravel bars, stepping stones and large boulders interspersed with clumps of grasses, shrubs, and wildflowers. If the water is so high that crossing looks difficult or dangerous, you want to turn around and come back to hike this another day - further upstream, the creek is narrower, the water swifter, and the channels more concentrated. I was able to rockhop this on my last visit, but it may well be a wade. Once across, the trail heads downstream a bit, then climbs the bank on the right side. The trail at this point is blazed yellow and white (for the Raider Camp and Mountains to Sea trails respectively). The trail heads upstream along the modest Raider Camp Creek. It's a steady climb, moderately steep, and it doesn't let up much, but trust me - it's the easiest part of this hike. Enjoy the rich woods and notice how frighteningly eroded the trail gets. In places, the old road bed has walls head-high on either side and it looks like it will keep on eroding as long as there is soft soil underneath. The water has nowhere to go but directly down the trail. This is a problem the Forest Service shouldn't have overlooked 20 or 30 years ago - it is way too entrenched to fix now without a full re-route of the trail. The trail will pull away from the creek up the mountainside somewhat, then return to it at a small, hard-to-see waterfall before pulling away for good yet again. 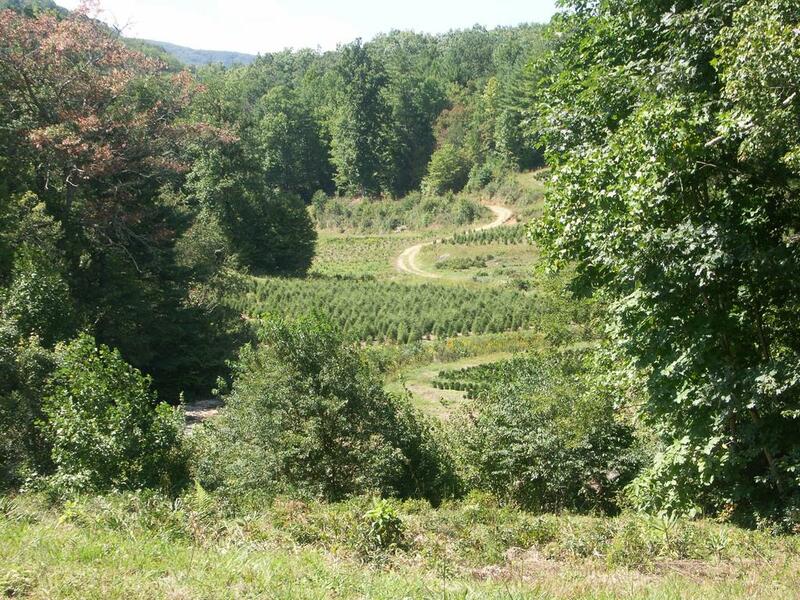 Along the way, you will see two primary types of evergreen trees: Eastern Hemlock and Eastern White Pine. The Hemlocks are more prevalent on lower parts of the trail and in coves, while the White Pines take over more at higher elevations on dry ridges. A mix of the two exists in some areas. The hemlocks are on their way out thanks to infestation by the Hemlock Wooly Adelgid; a lot of them are already dead. The trail reaches the ridgeline, then swings left of it again in a patch of young woods. Most of the short, straight trees here are tuliptrees. You'll climb a bit further to the next intersection, where you want to proceed straight. The climb lets up from here and you'll enter another rich forest. As the trail swings around a ridge, the forest used to be full of shortleaf or pitch pines - I'm not sure which - but the Southern Pine Beetle wiped these out several years ago and it's largely shrub and sourwood trees now. The trail crosses some wet-weather seeps before coming to the next obvious intersection. This is where the easy hiking ends - prepare to use your map and route-finding skills extensively from here on out! Here, the Mountains to Sea trail goes straight. Turn right onto the un-blazed, threaded path leading downhill along a ridge. 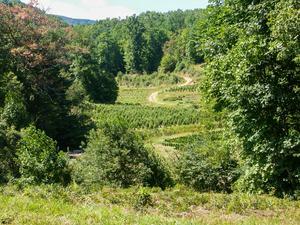 This is an unnamed spur trail to an overlook. This trail descends moderately through a dry ridgetop forest and gets quite a bit steeper near the end. There are a couple of forks; keep left and continue downhill on the most heavily used gully toward open sky. You should be able to hear South Harper Creek Falls off to your left. 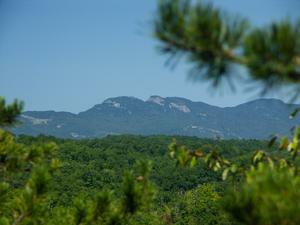 View of Grandfather Mountain from the overlook at South Harper Creek Falls. The path comes out at a rocky, high cliff point where you have a spectacular view of South Harper Creek Falls and Grandfather Mountain. South Harper Creek Falls from the overlook. The creek slides down a very long rock face 300 feet below you, and the low ridges of the surrounding mountains rise steeply on either side. Ironically, this waterfall is not on South Harper Creek - just Harper Creek. Its name is presumably to distinguish it from the falls on North Harper Creek and the plan old Harper Creek Falls downstream from where both merge, which you will see later on this hike. 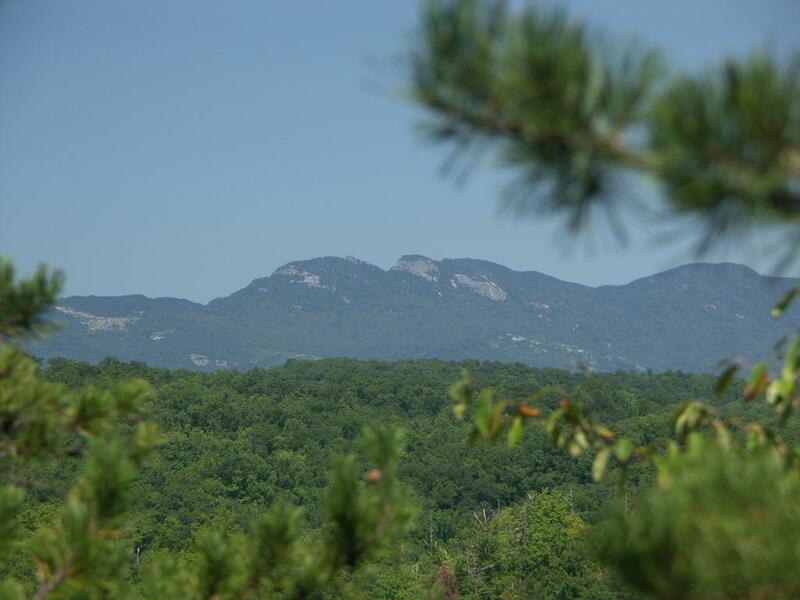 To your right, far in the distance, lies the craggy peak of Grandfather Mountain. Enjoy the view, but be extremely cautious (it is not a smooth platform all the way up to the edge of the cliff) and stay well back from the edge. Climb back up the gully path, keeping right this time. You are looking for the level, well-built connector trail that heads right from the overlook spur down to the Harper Creek trail at the top of the falls. Trouble is - at least as of the last time I hiked here - the connector was rather overgrown and hard to spot. (You probably won't see it on the way down, but if you do, take note of it). Once you are on the connector, push your way through the laurel. If the path keeps on going, you have found the right one. There is a fork after 100 feet or so; both paths come back together shortly and you'll climb up and over a couple of rocky crags. The connector begins descending the slope toward the top of the falls on several segments with switchbacks in between, and once you know what to look for it's easy to follow. Consider bringing a machete and making it easier for the next person when you come! The connector will descend into a small side cove which empties into Harper Creek at the top of South Harper Creek falls. The last few feet descend over a large rock with neat, natural stair-steps carved into it. An old tire was leaning against the shrubs to the right last time I was here, but don't count on seeing it. About 100 feet upstream is another nice waterfall, but that one may be on private property so don't approach it. Across Harper Creek is a large, angled rock and you will want to cross there. You may be able to rock-hop, but it may also be a wade. Remember: you are at the top of a high waterfall, so if the crossing looks to be unsafe to you, turn around. The trail resumes at the top of the angled rock and leads uphill a very short distance to the main, blazed Harper Creek trail, which sort of joins in from the left. Bear right at the intersection (straight, really) onto the orange blazed Harper Creek trail leading downstream. You'll pass the very top of the falls and then the trail switches back several times as it descends toward the base through a hemlock forest. The path is rather steep and rough at this point - some sections are highly off-camber and very slippery. 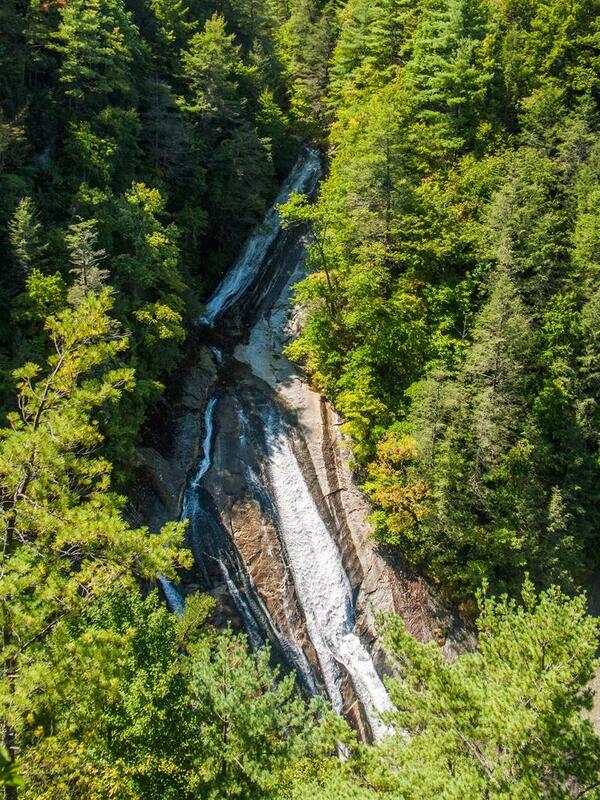 As you descend, you'll see several side paths that head toward the falls, but these are not recommended. Continue downstream where you will come out at the creek below the falls once it settles down a bit. From here, a tough scramble will take you upstream to the base of the falls in a neat, amphitheater like area with sloping rock walls all around. The trail and hike continues downstream on the other side of the creek. This will be your first of 10 crossings of Harper Creek on this section of trail (for a total of 12 on the hike, including the very first one on the Raider Camp trail and the one just upstream from the falls). The creek crossings are your main obstacle from here down to the last one above Harper Creek Falls. Each crossing has a bit more water than the one before. I was able to rock-hop 7 out of 10 of them last time I hiked this, but the last 2 of those 7 were a bit dicey in terms of staying dry. You may have to wade a majority of them and the last 3 of the 10 total crossings will be a wade no matter what. You'll also have to look carefully for the orange blazes on rocks at crossings - especially on the other side so you know where to emerge from the water. The rushing water and blaring sun tends to make blazes on rocks fade quickly, and blazes on stream side trees may be destroyed when trees get washed out by their roots during floods. But only one of the crossings had no blaze at all, as of last time I hiked, so it appears that blazing the crossings is a fairly high priority for trail maintenance folks. This is an area under study to become wilderness, and in a lot of ways it is very much like wilderness travel. Overall, the trail isn't made terribly difficult by climbs or roughness, but by the fact that it is sparsely blazed between creek crossings and very little traveled. The crossings and constant hunting for the right trail will take its toll. It gets heavily overgrown in places, it is very narrow, there are lots of confusing side paths almost as well-worn as the main one, and it is tight and twisty with lots of short ups and downs. 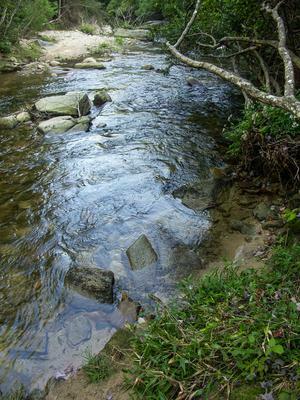 The path will come out on the rocks at the edge of the stream without crossing it a couple of times as well, so look for those blazes to know when to strike out through the water, and when to just return into the woods on the same side. If you're used to wilderness travel, this will be no big deal. After all, true wilderness trails have no blazes at all! But for those who haven't had much wilderness or pathfinding experience, this wouldn't be a bad place to start experimenting with it in order to get an idea of what to expect. It's not terribly long, and the few blazes that are there do help. Your first trip on a trail such as this will likely be taxing. People write me all the time, saying they were surprised by just how exhausted they were after this hike, and how happy they were to see the car! So for all the trouble, why even hike this trail? The scenery along the bottom of the gorge here is fantastic. The forest is lush and dense; the streamside areas are vibrant and healthy. Look for numerous signs of past flooding on this wild, free-flowing stream, such as piles of leaves and sticks stuck in the forks of rhododendron bushes waist-high. Sandbars, gravel bars, log jams, and natural rock levees attest to the power of the water during flooding. Large boulders force side streams into small waterfalls as they trickle into the main creek. 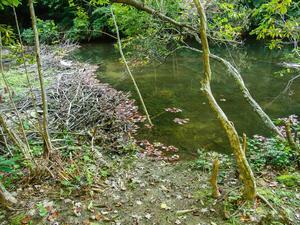 You may be lucky enough to see some felled trees and beaver dams on the lower portions of the trail. And if you're even luckier, you'll see a beaver, but the chances of this are pretty slim. Bear in mind that if you are caught here during a summer thunderstorm, or if one happens upstream, flash flooding isn't out of the question and it may be a long time before the water receeds enough to safely cross. You are far from help here, so be prepared. Do you have enough clothing, water, and supplies to spend the night in an emergency if you should become flooded out, injured, or exhausted? If not - don't hike this trail! After the 8th crossing, you'll come to the intersection with the Mountains to Sea Trail. Remember how that trail turned right back at the big campsite? This is where it ends up. Bear right, continuing downstream. The trail is a bit smoother, wider, and more well traveled from here on out. North Harper Creek (which the Mountains to Sea Trail follows) empties into Harper Creek here too, making your chances of rock-hopping the next two crossings almost nil unless the water is very low. Heading downstream, this is the last creek crossing on the Harper Creek Trail! Or the first one if you're going up. Eventually, you'll come to the final crossing which is not far above Harper Creek Falls. The trail gets a bit steeper and rougher and climbs some to pass around the falls. To get to the base - if you have the energy - continue down the Harper Creek trail a ways beyond the top of the falls to where it joins an old logging road at an angle. Turn right, and take the ridiculously steep and eroded path downhill to reach the base just before you get to the falls. A sketchy rope was tied to a tree here to make descending the last few feet possible, but it was frayed and wet. The pool at the bottom of the falls is one of the finest swimming holes anywhere in the world (surely), but the ropes that you sometimes find strung up the sloping rock are misplaced and unattractive. Don't encourage this - if you go for a swim, just enjoy the bottom pool and don't try to climb up the falls. Some people even slide down the lower drop, but this is definitely not recommended. No photographs can capture the true enormity of the scene, but you can sure try; on a well-lit or overcast day, it's a fine opportunity to take a shot. Once you've seen enough, climb back up to the logging road, go right back to the main path, and head downstream. The falls is where most people turn around when coming from the parking log, so the path is wide and relatively easy from here, aside from a few badly eroded spots. It's a short distance back to the intersection at the campsite - which will probably be a welcome sight by this point. Turn left, and return to your vehicle on the same trail you came in on to end the hike. Justen Williams said: Do you need permits or any documentation to camp or can you just set up shop at the sites? Garrett Smith said: Definitely an adventure! My girlfriend and I went out this past weekend, August 25 2017. We had a great time and did the loop counter clockwise as recommended. There were lots of large camping groups as well as day hikers towards the parking area, there were few deep into the trail. There wasn't a great view of either of the falls from the trail, but you could see them if you took packs off and scrambled down a side trail. Raider camp was steep but not too bad. Harper Creek trail was difficult to follow but we never got lost due to some helpful pink markers that had been left by someone. The crossings were mostly wading with some rock hopping. The campsites had some trash and were well-used. Overall though we did enjoy the experience. Jim Suiter said: My girlfriend and I did not know exactly what we were in for when we did this hike on Monday, June 19, 2017. My girl friend found the hike in Allen de Hart's book and indicated it was around 6 miles. We had the Nat. Geo. map, but not much other info. Allen did not give an exact mileage for the loop, so you had to piece it together from all the trails being described in the same section. *After* the hike, I did just that and came up with the following reckoning going counterclockwise in the loop: 5.2 - Parking lot to S. Harper Creek Falls junction w/ Raider Camp Tr. 2.8 - Raider Camp to junction w/ Harper Creek Tr. 1.3 - Junction back to parking lot --- 9.3 miles total (and add 0.3 mile or so, round trip, on the spur to the first falls) We had no idea of the number of creek crossings and the difficulty we would encounter in following the trail between the Harper Creek Falls and South Harper Creek Falls. Trying to reconcile our imagined 6-mile hike onto the actual 9-mile loop, caused us to doubt whether we were still on the right route. We were never lost or off trail (at least not by much), but at one point at about mile 4.0 or so, I thought we were. Thankfully, there were just enough orange blazes to give us some reassurance, and the surveyor's tape on limbs overhanging the creek crossings was very helpful. It was a great feeling to finally reach the top of South Harper Creek Falls. It took us about 7 hours to complete the hike. For the first 3 creek crossings my girl friend took off boots, and put them back on for each one, which slowed things down a little. After trying to rock hop the next crossing and failing, she left the boots on. Mine got soaked on the first crossing. The water must have been unusually high, as *none* of the crossings were rock-hoppable, at least near where the trail crossed. Mark said: Great loop, some say it's 6 mile long, this site says 8 miles, but, since it took 5 hours and my gps shows 12 miles I believe it to be close to that mileage. No way it's 6 or 8 miles. I did it counter clockwise. The first 4 miles are well marked as mountain to sea trail. Next 4 miles are roughly marked at best, you'll see a tree blaze every mile or so as you make multiple creek crossings and climbing towards south Harper falls. Kinda keep hopping back and forth across the creek. It's pretty rough. You'll climb up the right side off the falls...your final water crossing as at very top of the falls...it felt so great to finish this portion...the falls are awesome. After you cross the creek at top of falls you'll run into various blaze colors, some, red, some blue, but eventually after a 1/4 mile or so you'll finally see the white mountain to sea trail. This finally sends you south east and down raiders, what a great leisurely hike down to raiders, probably feels so good because the hell you just went through! :) it is a great final 3 miles or so from the top down past the final crossing of Harper at the big campground. Then it's off to your car and straight to Wendy's for a triple meat with cheese and a jumbo Coke! Some asked about dogs...the rope portion isn't really part of this loop, it's on a spur you can take or not take. I wouldn't take my pup because the far side of the loop is super steep and really off camber. I would worry about her taking a spill there. It's a long way down. 3 mile out and backs up Harper or Raiders are great dog sections. It's just that furthest point from you car that's sketchy for the pups. Not impossible...just sketchy in area that is far from everything. Think I'll do it clockwise next month. Also, I took the a sandals with me to switch out for crossings, then back to light hikers. Used the sandals fro most of mile 5-8. The crossings are sanding and the distance are long so it was the only way to avoid blisters. Might try keen sandal/hikers next time to avoid all the shoes changes. Thanks to the original poster...this trail loop is difficult to describe. Michael said: Just finished this hike over the weekend. It's an excellent hike and I highly recommend it. We came in from the opposite end from behind South Harper Creek falls and took a left on the loop. We were able to rock hop all water crossings, thankfully. I will say both waterfalls are great but tough to get to. Saw more snakes at the bottom of South Harper Creek Falls than on the rest of the trail, but that's ok. Plenty of campsites down near Harper Creek Falls, probably more than I've seen anywhere. Lots of foot traffic there also. On the way back before you get to the south falls it got almost impossible to follow the trail and we ended up on private property. The falls in the description they said my be on private property definitely is. It's a great trail but I think I would do the Raider Camp side first next time going down all those hills. Jason Kowalski said: Just got back from hiking this beautiful area. Very difficult to follow the blazes. Camped the first night on the 260 trail, beautiful site about a mile in from the parking area. Left base camp the next morning, hiked to the first major intersection. Went up the steep hill ended at the top above the falls. Was trying to find a way in, hiked back to the bottom ended up rock scrambling with my Black Lab/Pit mix ( he was loving it!) all the way to the lower falls. Ended up finding an rope leading half way and then using trees to continue climbing up to where I originally was. Couldn't find where the trail continued either, this section was confusing. Once I found, very pleasant experience to my first creek crossing. I was not expecting this. The first was about ankle high. Then the second and third crossings came along, my dog began to really dislike these, having to pick him up and carry him (35 lbs) across. I lost count after 7-8 (some being almost waist high, most about knee high). I was fortunate to not seeing any snakes or wildlife along the way but it was chilly. About 60 degrees in the daytime. I realized I was following the Mountains to Sea Trail for the most part (white blazes). Not wanting to turn back I kept going. Ended up along an waterfall, not sure which one. Didn't get a real good view. Ended up at the trailhead for 266-A on Pineola Road. At this point I was freezing, it was getting close to dark and unsure how to get back to base camp from there. A few people drove by not stopping, not sure if they thought I was waving or what their problem was. Ended up making an emergency call and thankfully Avery County 911 was nice enough to send an officer out and give me a ride back down to the 260 trailhead. Left my dog in the car-he was tuckered out. Hiked the mile back in, broke camp and high tailed it out of there at sunset. The mistake I made was I didn't buy the 9.00 map they were trying to sell at the Friends of Wilson's Creek Visitors Center. According to the checklist for hiker safety I had all the other items I needed. One thing I have to say is with the purification tablets the water from the creek was some of the best tasting I've ever had! Again, huge gratitude is owed to Avery County Police Department. Please don't make the same mistake I did, and BUY an MAP!!!!! Overall, some of the most beautiful scenery I've seen on the east coast, very reminiscent of Colorado. Jordan M. said: We field checked the lower part of the trails (to Harper Creek Falls) in Fall 2011 and they were in good shape. It's been a few years since I hiked the upper trails. Remember, this is a very wilderness-like area! Dogs may have trouble on the scramble down to the falls, and maybe on some of the crossings - especially if the water is high, and especially if they're small. mark said: I've got two good climbing dogs but from what I've read I am hesitant to take them on this trail. They can scramble steep slopes but can't use ropes. Any input much appreciated. Joshua James said: Used your guide here while planning a wilderness trail run on Harper's Creek last weekend. I wanted to add some winter water crossings to my training and this was a perfect trail for that. I snagged some GPS coordinates for trail #260 that may be handy to add to your site, a new hobby of mine. 35.977505,-81.76662 is the lower parking lot at 7973 Brown Mountain Beach Rd, and 35.988358,-81.82493 is the upper trail head 6.1 miles away. 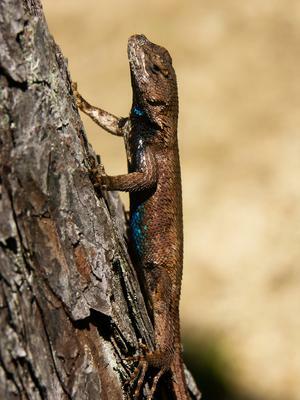 Bill M said: Hiked the North Harper Creek Shortcut to the North Harper Creek Trail to the North Harper Creek Falls trail back to 464 for the walk back to my car. Then drove down to the Hunt Fish Falls access and hiked down and back up. I want to thank Jay for talking about the creek crossings as a I brought a towel and glad I did as I hiked these trails two days after several days of rain. Not one crossing was able to be rock hopped. It was either shimmy across and downed tree or off with shoes; thus happy to have a towel to dry off the feet (think next time I'll bring a pair of water shoes...thanks M Patty for the suggestion). Have to say it was a tough hike but the scenery and the falls at the end were worth every step. Also; thanks to Jay for suggesting the map. Although; it didn't help at the end of my Harper's Creek to Raider Camp hike the next day as I could never find Raider's Camp and ended up being stranded overnight sleeping on the ground under a pile of leaves for warmth...oh well...a lesson learned....allow more time. All in all.....what beautiful country and wonderful hikes (a definite workout). The solitude was also very nice as I saw like two people the whole time on the North Harper Creek Trails and Harper Creek Trails. Also took some awesome pictures. 54 years old and can't wait to go back to hike some of the other trail plus the Wilson Creek trails. M Patty said: I just got off this trail this morning. We did it as an overnight trip. We went the reverse route of the description and camped near South Harper Creek Falls for an easy downhill hike on Sunday. As far as the trail goes (remember I did this in the opposite Direction) once the trail leaves the mountains to sea trail on the north end of the loop, be prepared to rely on your map reading skills and compass. Before this it is easy to follow just remember that when two trails run together only one is going to be blazed so you will actually follow several different colors along the hike. After leaving the mountain to sea trail you will only see a very few trail markings. The trail is extremely overgrown and in many spots you will be guessing if its a game trail or a hiking trail. Do not hike this without the Wilson Creek map and an understanding of how to read it. There were several times that I was relying on the contours of the map and where the stream was. During this section is where most of your creek crossings are. They were about half and half rock hopping and going with watershoes(highly suggested). During the rock hopping it is extremely helpful to have a hiking pole to balance you because many of the rocks are very slippery. Once you get past the last creek crossing the trail was pretty obvious but this is where the steep climb starts. In this steep climb there are a few places where the trail has washed out and there is about a 100 foot drop below you. Once you reach South Harper Creek falls the trail is a cake walk with places where you can have two people walk side by side. The views are amazing as stated above. Also once we split from the northern end of the mountains to sea trail we did not see anyone until getting almost back to the trail head. Do not let the huge crowds in between the trail head and Harper Creek Falls deter you, as they will disappear as soon as the trail gets rough. Christopher Patton said: This was a great hike! Even though you get to summit Mt. Mitchell my hiking partner and I found this one to be much more rewarding/fun/treacherous. Your're write up was extremely helpful and thorough. We got lost only once but that was our fault for not going down stream after the first creek crossing. The view of South Harper Creek Falls was worth the entire hike! pedro de armas said: im from south florida and im trying to figure out how to get to this location...thank you so much. Jim Stephens said: I wish I had found your hike description before making this first trip up Harpers Creek just last week, April 15, 2011. We were told, at the visitor's center, to follow the orange blaze all the way around the loop and therefor went out without a map. Beautiful hike up Harper's Creek following the orange blazes but be prepared for wet feet in the spring and for a lot of hunting for orange blazes. We never found the loop back and followed the orange blaze to the northern trailhead. Fortunately, a kind hunter picked us up after 2.5 hours of walking on a gravel road and returned us to our car (40 minutes later). I will return but not without a map!!! J. Stephens said: I wish I had found your hike description before making this first trip up Harpers Creek just last week, April 15, 2011. We were told, at the visitor's center, to follow the orange blaze all the way around the loop and therefor went out without a map. Beautiful hike up Harper's Creek following the orange blazes but be prepared for wet feet in the spring and for a lot of hunting for orange blazes. We never found the loop back and followed the orange blaze to the northern trailhead. Fortunately, a kind hunter picked us up after 2.5 hours of walking on a gravel road and returned us to our car (40 minutes later). I will return but not without a map!!! Ronen Plesser said: Hiked this in August 2010 with a 15 and a 13-year old. The description of the hike is beautifully accurate, we had very little trouble finding trails. Parts of the trail are quite overgrown but only ambiguities are at campsites where there are trampled trails in all directions. The spur trail to the overlook is now blazed in blue which can simplify things at that point, and there is no need to go into the gully with a nice trail just to its right. Snakes (I can't vouch for the species) were all over the place and were pretty much the only large living thing we saw. 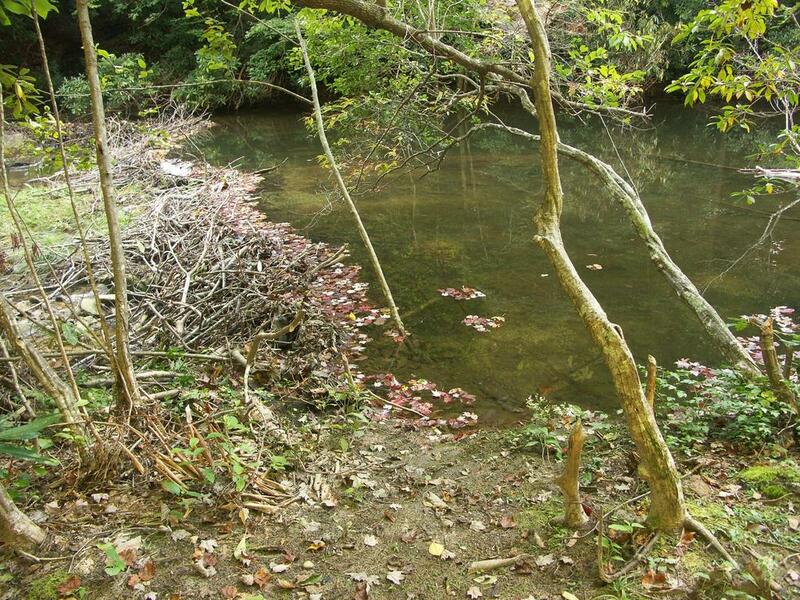 There is a beaver dam not far from the intersection of the South Harper and Harper that is the prettiest I have ever seen. Water crossings (in August) were not too hard, all rock-hopping. Jay said: Just got home from this and wanted to note that, while I've done the Mt. Mitchell-Black Mtn. Campground round trip, this was MUCH more difficult. But fulfilling? Yes. Your guide to the hike is great and just wanted to note a few things that seem to have changed since you wrote. Finding the overlook to South Harper Creek Falls was much easier than I thought it would be. If you have a WIlson Creek Area map (and lord help you on this hike if you don't) just follow what appears to be the Raider Camp trail until you reach it. It will be somehow blue blazed at that point, but it drops you right there. The tough part is realizing you then have to come back up to a red-blazed trail (occasionally) on the right to get to the next part of the hike. THIS part was not very overgrown this time. The tire is, indeed, gone from the spot indicated. Turns out it (or another tire) was marking a spot at a campsite downstream where it seemed like the trail was just gone. And there was this tire and, what-do-you-know, there's the trail. The creek crossings... I'd say it was an average water day today from looking at the waterline/shoreline. Your 7/10 rockhopping estimate is right on. On two, I cannot believe I did this, but removed my boots and went barefoot. There was just no way otherwise. One other, I should have. Instead, I got wet socks. The Harper Creek Trail - ESPECIALLY the first part from the top of the falls to about the 5th or 6th crossing - is extremely overgrown as of July 2009. Hikers need to be prepared to deal with that and to make intelligent choices. Go slowly, look and think. The trail will present itself sooner or later. Jordan Mitchell said: Good idea. I'll get that done as soon as I can, and start applying it to the other hikes too. Thanks! Sunshine said: Please insert trail numbers where you describe changing from one trail to another.